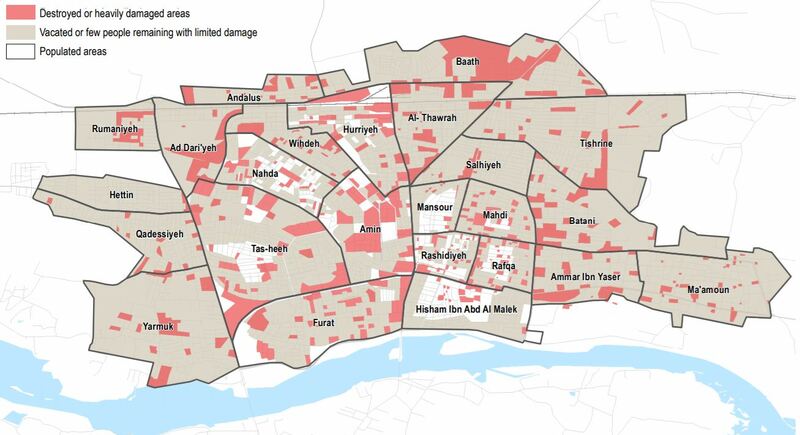 Two months since the start of the offensive to retake Ar-Raqqa city from the group known as the Islamic State of Iraq and the Levant (ISIL), ground fighting and airstrikes in and around Ar-Raqqa city have led to mass displacement and a deterioration of the humanitarian situation inside the city. REACH has been monitoring the humanitarian situation inside the city since the beginning of the offensive and between 25 and 27 July 2017 conducted a third rapid assessment of food and markets, shelter, non-food items (NFIs), basic WASH and health services, and the protection situation within the city. Information was collected through direct qualitative interviews and participatory mapping exercises with 23 key informants who had recently left Ar-Raqqa city, reporting on their neighbourhood of origin. The latest assessment found that residents have continued to flee Ar-Raqqa city, with the population estimated to be between 10,000 and 25,000, compared to 20,000-50,000 three weeks ago. Many of the eastern and western neighbourhoods of the city are now abandoned or almost abandoned. Many of those who have fled the city reportedly hope to return as soon as possible. Returns are not expected within the next month due to ongoing conflict, though key informants reported that shelter rehabilitation and mine clearance operations would likely hasten returns. For those remaining inside the city, the situation is extremely difficult. Residents face increasing threats to their safety, including airstrikes, indirect fire, improvised explosives, mines and sniper fire. Furthermore, access to food and markets has deteriorated, with residents relying heavily on food stored previously to survive. Food is only sporadically available to purchase from conflict traders and smugglers at inflated prices. Access to water is likewise extremely limited, as the majority of residents can no longer access the Euphrates River due to safety and security concerns, and are instead relying on recently drilled boreholes. Electricity is also difficult to obtain. Although in the central neighbourhoods in which residents remain generators are in operations, these provide electricity for only 2-6 hours per day and supply is reportedly inconsistent. Healthcare facilities and services have been minimal since the beginning of the offensive. Currently, functioning health facilities are limited to one wing of the national hospital and informal care points established in personal homes which lack medical professionals and equipment. Residents remaining within the city and those attempting to leave face significant threats to their personal safety and well-being. REACH intends to continue monitoring the situation and provide regularly updated humanitarian information. Access more detailed findings in REACH Ar-Raqqa City Situation Overview III.